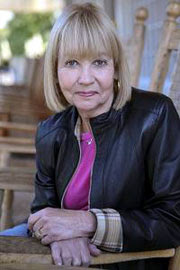 Barbara Levenson is the author of the debut mystery, Fatal February. Before she discusses marketing of books, I'll reprint the summary of the first Mary Magruder Katz mystery, from Barbara's website. For half Jewish, half Southern Baptist Miami criminal defense attorney Mary Magruder Katz, life starts to spin completely out of control when a minor fender bender turns out to be an unlikely shot from Cupid’s bow. Carlos Martin, the other car’s driver, isn’t just a distracted driver; he’s distracting. Carlos is charming, handsome, and mysterious. Hardly before she knows what hit her, Mary breaks off her engagement, jumps into a sizzling romance with Carlos, gets fired from her former fiancé’s highbrow law firm, starts her own practice, and lands her first client, Lillian Yarmouth. But Lillian isn’t just any client; she’s the prime suspect in what’s become the Miami society murder of the year. While investigating Lillian’s alleged crime of passion, Mary finds that this case, like all matters of the heart, is anything but black and white. And Mary has clearly stumbled onto something that has someone seeing red. February may be the shortest month of the year, but Mary’s got some long days (and nights) ahead. This month could be a real killer. Now, I'll turn the blog over to Barbara, so she can discuss marketing books. Thank you, Barbara. Everyone involved in the book business: writers, publishers, editors, publicists, all have one or more theories. 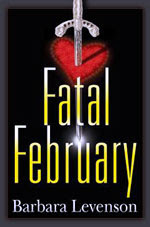 FATAL FEBRUARY is my first published mystery novel. Writing a book is easy and pleasurable for me. But little did I know that once the book is finished and sold, my time would be consumed with “promotion”. I am not unfamiliar with selling myself, having been through multiple election campaigns as a candidate. Selling my book to the public is a different experience. The first task is selecting the right art work for the cover. I know this is important. I am one who loves to browse bookstores and am an impulse reader when a book seems to call to me from the shelf. However, my knowledge of art work is confined to enjoying outdoor art shows. I cannot draw. Even the photos I take are generally poorly focused and off center. Fortunately, my publisher, Oceanview, has a wonderful artist who took the job and the decision out of my hands. Next, the publisher explained that I must get “blurbs” for the back cover. What is a blurb? It’s a short few sentences by another author or celebrity who has read the ‘ARC’, or advanced reader copy of the book, and is willing to say something very nice that will end up in print. So supposing my book is of a certain genre and takes place in a well known location. Another author whose writing falls into those same categories may not be too happy to give a boost to the competition, or their publisher may nix them applauding someone who may drain away readers. On the other end of the spectrum, an author who writes poetry may not be into mysteries. It helps to solve this problem if you have lived long enough to have wide circles of contacts. So more time is spent in areas which consumer the time from writing. Writing is what most writers want to do. “You must have a website,” is the next directive. This is the place where your readers and reviewers can see what you look like, what the book jacket looks like, what your biography tells them. It seems everyone has a website: doctors, lawyers, authors, teenagers, college kids, store owners. It wouldn’t surprise me to find a website for the men who mow our lawn. More time is eaten up in obtaining the right webmaster, and approving various items to fill the website. All of these time-eaters occur months before the actual publication date, which I have also learned is an illusion. Long before the actual assigned date of publication, hundreds of people have read this book, posted reviews, and purchased the book on line. Finally, the big day arrives. Book signings are secured in various parts of the country, travel plans are made, and then the question arises. Where are the next two books? How soon will they be ready? So what sells books? The end paper in the NEW YORK TIMES Sunday book review recently published two interesting essays. One concerned blurbs and whether they were necessarily read by potential readers, and, if so, did the blurb make the reader decide to invest in the book. The essayist drew no conclusion. I am a voracious reader, but until I was told to secure some blurbs, I could never recall having read any. My guess is that all of the promotional tools can’t hurt sales. Younger audiences, in particular, are appreciative of technological advances. They expect to see a website and want to be able to communicate directly with an author. However, if a book is not interesting or exciting, all the promotions in the world will not draw readers to more words from that author. I’d like to write more on this subject, but I just got a phone call telling me I need a video trailer to enhance “my presence in the world of publishing.” Does anyone know a good videographer? Fatal February by Barbara Levenson. Oceanview Publishing, ©2009. ISBN 9781933515526 (hardcover), 264p. Good eplanation of the marketing process. I believe you hit the mark here. Of course book content is important as well and it appears you hit the mark here as well. Thank you! I'm sure it's always encouraging to a new author to have someone comment on their guest blog. Thanks for writing about Barbara's post. thanks for the great interview. Oceanview is a wonderful pub to work with, I've heard. Good luck to Barbara! Neat interview - very insightful. It is interesting to read all about the entire writing process. Good twist from the typical interview! Thank you, Rebbie. Like you, I wish Barbara good luck. Thanks! I'm glad Barbara was able to write something with a twist. Thank you for taking the time to write the guest post! I appreciate it. And, good luck with Fatal February! Excellent guest post, very informative. Blurbs...yes, I do read them and if it was from a writer's whose work I really respect,yes, it could influence a sale. Book cover...forget that 'don't judge a book by it's cover'. I do think it matters, to a degree. Not a deal breaker but important. Web site? no. Video trailer? no. Can't say they influence me at all. But now a really good review from someone's whose reviews I tend to agree with is huge! Thank you, Caite. I'm sure there are a number of authors interested in what attracts a reader. I agree. For me, it's usually a good review from someone I trust. But, I did read one author because I LOVED her original website. Alex Kava had one of the best websites I ever saw for her first two crime novels. Over time, her site has become just another website, but, at the time, I ordered the book for the library because of that site, and I used to drag people to the computer, and say, you have to see this site. I want to read this book. Nice job on that site. (But, she was a web designer.) Sold me. nice post, thanks for sharing! Thanks for commenting. I appreciate Barbara taking the time to drop by. great article. very informative and helpful. thanks. keep it up. very interesting article. keep it up!